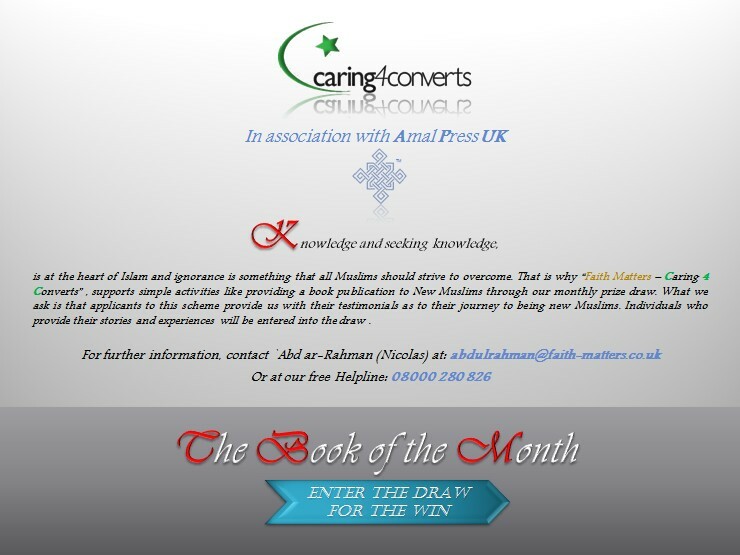 Caring 4 Converts was launched in April 2009 and curently in partnership with Amal Press UK, we are launching "The Book of the Month", which will offer new Muslims the possibility of winning publications from a Sunni Muslim perspective. 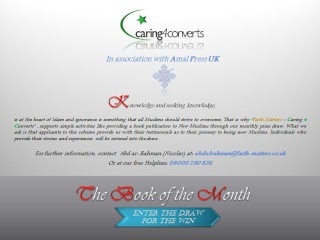 The books are selected on the following criteria; they cover one or more of the 3 branches of the religion (see the article here) and relate to the Holy Qur'an and the Prophetic Tradition (Sunna) of our Beloved Prophet (Salal-Lahu `alayhi wa Salam / May Allah praise on Him and grant Him peace). How to be entered into the draw? We are looking for your perspectives and experiences of your journey to Islam and you can call and provide us with this information through the free helpline number for the Caring for Converts programme, 0800 028 0826. You can also provide us with a contact number and name and we can call you back if need be. Participants who are successful will be able to collect the book and their story (anonymised), will be displayed on our web-site.